Perrysburg, OH (Mar 13, 2019) - Irene Butter told 400 students to never be a bystander. “That means that we can't turn our backs when things happen that are unjust, mean, evil,” she said. “All human beings are cut from the same cloth and it doesn't matter what color, ethnicity, religion, or gender [we are]. If we open ourselves to meet the other, we'll find out that the differences between us are far smaller than what we have in common.” Read more in the Toledo Blade. Oxford, CT (March 6, 2019) - The D-Day Squadron, Tunison Foundation, announced its official support of the “People of D-Day” resource trunk and its companion website at www.DDay75forstudents.com. A “trunk” is a trove of hands-on materials that connects students with the experiences of those that participated in the world’s largest seaborne invasion, as well as those whose lives were directly impacted by one of the most pivotal moments in history. The People of D-Day trunk will contain Shores Beyond Shores as one of its two anchor books. Read more here. 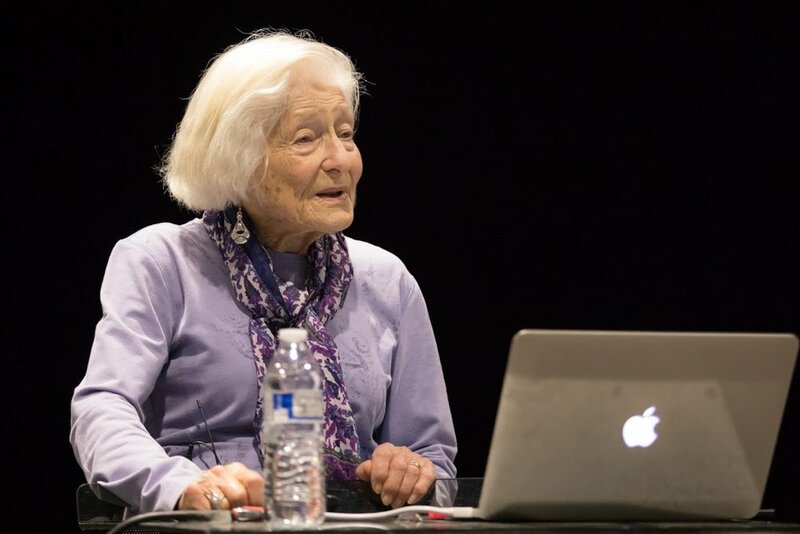 Toledo, OH (March 6, 2019) - With the 75th anniversary of D-Day in June, Irene has been identified as a person of D-Day, representing those who suffered in the concentration camps. Her story is being promoted in education programs Read more here. Ann Arbor, MI (Feb. 18, 2019) - Irene with Girl Scout Troop 45003 after her presentation at the West Side United Methodist Church in Ann Arbor. 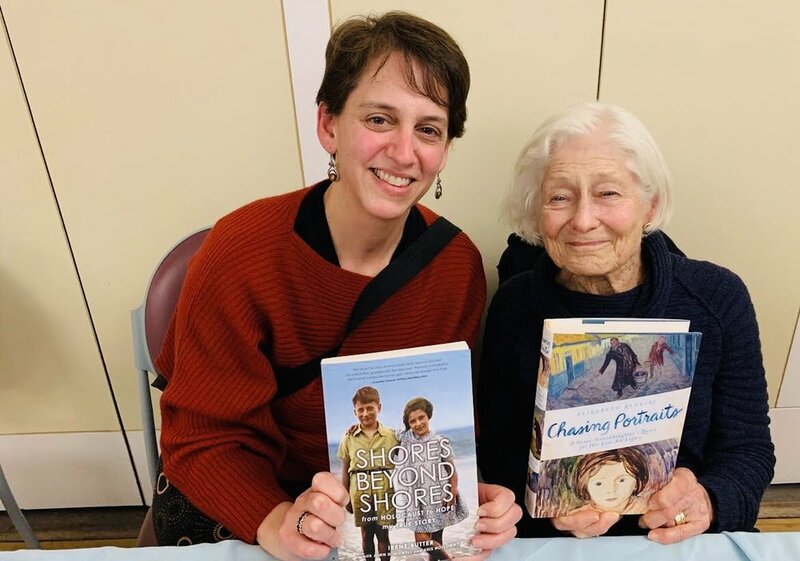 February 10, 2019: Irene with Bay Area author and film-maker Elizabeth Rynecki, creator of Chasing Portraits. Suffield, CT (December 3, 2018) - Irene spent the day at Suffield Academy talking with classes and giving a keynote address. She focused on the power of one person’s actions. Irene said, “I didn't ask to go through the Holocaust, but I was saved through the miracles of luck and the love and determination of my Pappi (father). I owe it to him and everybody who suffered to talk about what I learned because suffering never ends, so our work must continue.”Asked what she would say to her younger self if she had the chance, Irene paused, and said “I would tell myself to try and save my Pappi,” who died on their train to liberation. Irene signs books after her keynote address at Suffield Academy. Co-author John with Irene and John’s cousin Hillary Cahn who works and teaches at Suffield Academy. Washington, DC (November 13-14, 2018) - Irene presented at Washington Hebrew Congregation, and at the Library of Congress with co-authors Kris and John as part of a an annual event cosponsored with George Washington University in commemoration of the 80th anniversary of Kristallnacht (Night of the Broken Glass). See video of presentation. Irene presenting at Washinton Hebrew Congregation. Co-author John, Gretchen Bloom (family friend of Kris’s), Irene, and co-author Kris at the Library of Congress. Washington, DC (November 8, 2018) - National Public Radio’s Joshua Johnson/1A interviews Irene as part of the segment commemorating the 80th anniversary of Kristallnacht and the importance of never forgetting. The titles were selected on the basis of their appeal to reading groups, which seek books that open up lively conversations about a myriad of timely and provocative and diverse topics, from the intimate dynamics of family and personal relationships to major cultural and world issues. 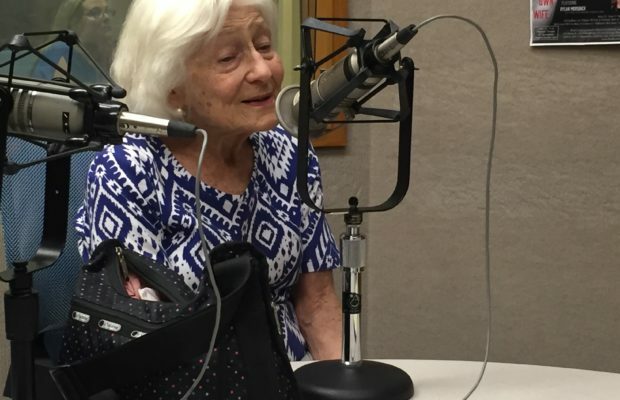 Ann Arbor, MI (September 19, 2018) - Michigan Radio interviews Irene (link/listen here). (August 29, 2018) - "This book was definitely not light escapist reading, but necessary. This should be required reading in high school history classes." Read more! Ann Arbor, MI (June 30, 2018) - Irene speaks against Trump's immigrant family policy at a large Families Belong Together rally, saying that the fact that "hundreds of vulnerable children are subjected to this extreme trauma is totally devastating and heartbreaking for me. We are here today because we all have a social conscience and recognize that all of us are responsible for each other. We cannot be bystanders." Northampton, MA (June 20, 2018) - Irene spoke about the dangers of history repeating itself on the Bill Newman Show on WHMP. A crowd of well over 300 listened to Irene's presentation at Hampshire Regional High School, braving a storm and power outage! Thanks to Chris Butler and Anne Howland for organizing. Irene presenting at Hampshire Regional High School in Westhampton, MA. Westhampton, MA (June 18, 2018) - A crowd of well over 300 listened to Irene's presentation at Hampshire Regional High School, braving a storm and power outage! Thanks to Chris Butler and Anne Howland for organizing. 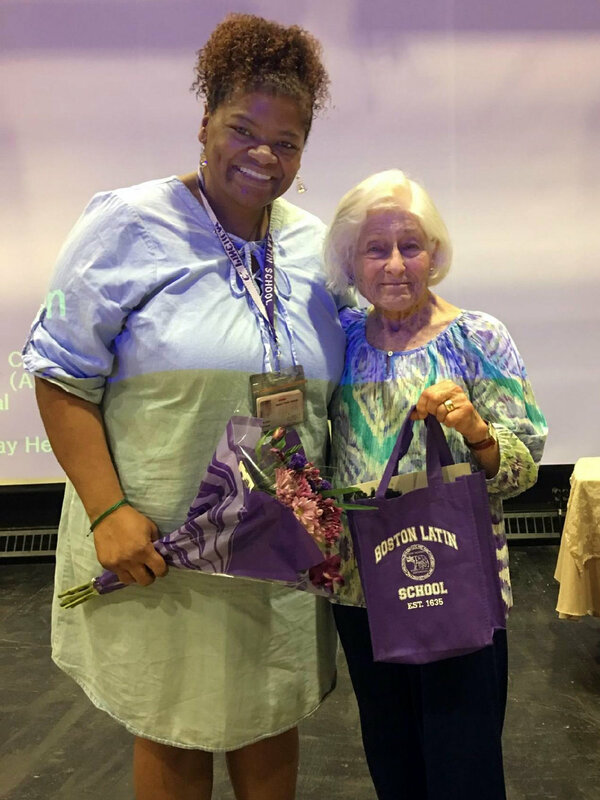 Irene with Boston Latin School history teacher Cheralyn Pinchem. Boston and Newton, MA (June 11, 2018) - Irene spoke at Boston Latin High School, and Irene and Kris presented at the Newton Free Library to a large crowd. See the video here. Washington, DC (May 28, 2018) - Deborah Kalb interviews Irene about why she wrote her book and her experiences. Irene with co-authors John Bidwell and Kris Holloway signing books. Ann Arbor, MI (May 8, 2018) - A full house of 371 attendees greeted Irene at the Ann Arbor City Library for the launch of her book (video). Read more in The Michigan Daily. Ann Arbor, MI (May 3, 2018) - Patti Smith interviews Irene and her book. Ann Arbor, MI (April 30, 2018) - Irene talks about the importance of her book to keep the world from forgetting. Listen. Fountain, MI (March 18, 2018) - Irene speaks after the performance of "The Diary of Anne Frank." Read more here. Little Rock (Feb 13, 2018) - President Bill Clinton sends note to Irene thanking her for presentations. Little Rock (Feb 10, 2018) - Irene shares her story, implores Americans to be vigilant against signs of authoritarianism (Northwest Arkansas Democrat Gazette). Little Rock (Feb 1, 2018) - Irene was the keynote speaker to over 1,000 attendees at the Clinton Presidential Center on January 31-February 1, making it one of the Center’s most successful and popular events, according to Center staff. See THV 11 interview with Irene. Irene speaks at Clinton Presidential Center. John, Irene, Kris, and Paul Bash at the Clinton Presidential Center.